The Museum was designed with four key principles in mind: memory, authenticity, scale, and emotion. Its architecture intends to provide the most sensitive, respectful, and informative experience for visitors. 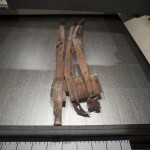 The Museum is located beneath the 9/11 Memorial at the World Trade Center in lower Manhattan in New York. 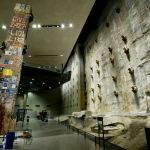 The 9/11 Memorial Museum gives visitors a first-hand encounter with the site and artifacts at the actual location of the attacks. The artifacts range in scale from the monumental to the intimate, which the design had to accommodate. One of the primary goals in the Museum’s design is to remind people what existed on the site before 9/11. Within the Museum, the inverted volumes of the original World Trade Center towers bring to memory their presence in the city. 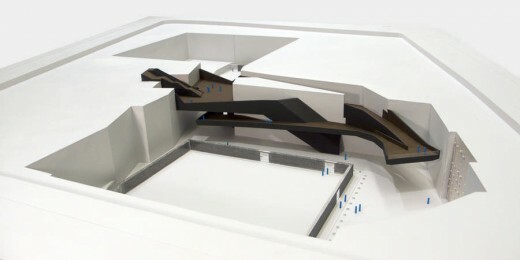 Opening in May 2014 and designed by Davis Brody Bond, the 9/11 Memorial Museum was conceived as the global focal point for presenting and preserving the history and memories of the events of 9/11, documenting the impact of the attacks and exploring their enduring significance. The Museum is located beneath the 9/11 Memorial at the World Trade Center in lower Manhattan in New York. Descending nearly 70 feet to the original foundations of the World Trade Center towers, its 110,000 square-foot interior will give visitors access to the monumental underground site where remnants of the Trade Center’s construction and recovery frame the story of the terrorist attacks and the days that followed. Confronting the physical void left at the end of the recovery process, the spaces of the museum are revealed, progressively disclosing the various elements of collective and personal memory of the event. The design team at Davis Brody Bond inherited a fixed set of existing geometries at the site and was faced with the challenge of translating them into a series of coherent spaces that are punctuated by surface, texture, and volume. 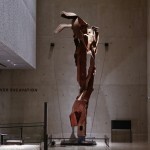 They chose as the Museum’s main narrative element a gently descending procession (dubbed “the Ribbon”) that guides visitors from the plaza to the bedrock level where the sheared base columns of the World Trade Center towers are revealed. The “Ribbon” recalls the ramp used to remove debris from the site in the aftermath of the attacks. It also offers multiple views of the slurry wall, the original retaining wall that was built to withstand the lateral forces of landfill and river, and which survived the collapse of the towers. 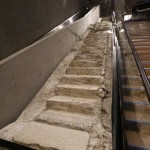 At the end of the ribbon, the descent continues down along the Vesey Street Stairs (“Survivors’ Stairs”), which were used by hundreds to escape to safety on 9/11. It ultimately leads to two exhibition spaces and Foundation Hall, the Museum’s culminating space whose sheer scale conveys the enormity of the site and reinforces awareness of the absence of what once was there. Memory – One of the primary goals in the design was to remind people what existed on the site before 9/11. The World Trade Center towers were fixtures on the New York City skyline and part of the daily life of hundreds of thousands of people. Within the Museum, the inverted volumes of the towers bring to memory their presence in the life of the city. Authenticity – Few memorials occupy the site of the events they commemorate. The Museum is located where the attacks occurred and where the recovery process began. It gives visitors a first-hand encounter with the site. The artifacts also speak to this authenticity. 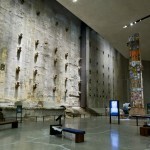 Ranging in scale from the monumental to intimate, they include the slurry wall, the foundations and column bases at bedrock, as well as artifacts carefully selected during the recovery. Scale – The World Trade Center was enormous, as was the impact of 9/11. The scale of the original building has been preserved and contributes to the impact of the visit. Foundation Hall is a cathedral-like space, a place of meditation. It is bordered on one side by the North Tower volume and on the other by the 60-foot slurry wall. 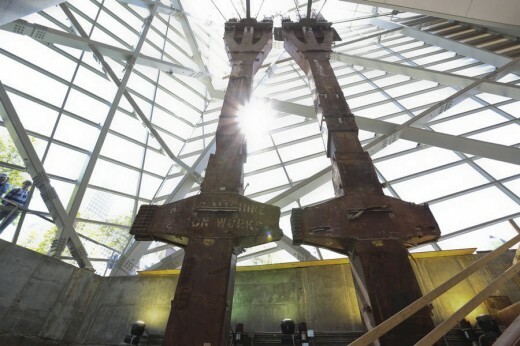 It also houses the 58-ton steel “Last Column” that was ceremoniously removed from the site on May 30, 2002, marking the official end of the nine-month Ground Zero recovery effort. Emotion – How visitors will experience the Museum has been a significant consideration in its design. The design ensures that visitors, when confronting subjects of emotional intensity, includes areas that allow and promote moments of solemnity and contemplation. Materials – The Museum employs three basic materials: concrete, aluminum, and wood. The careful use and juxtaposition of these humble materials creates an environment that evokes both the raw character of the site and the period of recovery, yet also provides tactile elements that are familiar and comfortable to the visitor. Entry – Visitors enter the Museum through a pavilion located between the Memorial’s two reflecting pools on the plaza. 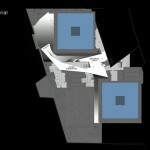 It includes a private space for 9/11 victims’ families and a small auditorium. The Museum’s entry pavilion was designed by Snøhetta. Public Spaces – Visitors descend from the entry pavilion to Memorial Hall where they experience a first view of the larger space that reaches to bedrock and proceed through an introductory exhibit and past a series of iconic artifacts. Exhibition Spaces – The primary exhibition spaces at bedrock provide visitors with historic and educational content about the events. These areas are located on the footprints of the Twin Towers, directly below the Memorial Plaza’s reflecting pools. 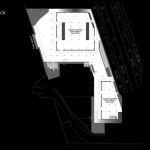 The North Tower footprint area will house a historical exhibition; the south footprint area contains a memorial exhibition, education center, and excavation of the original structure. Thinc Design with Local Projects, LLC served as the lead exhibition designers. The historical exhibition was designed by Layman Design. 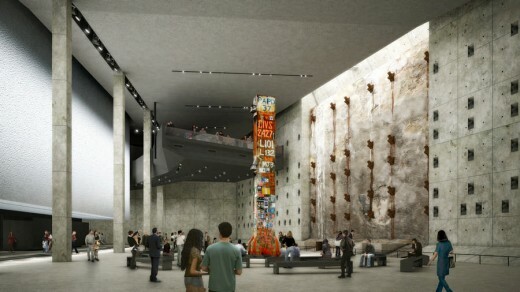 Design Team – Davis Brody Bond is the design architect of the 9/11 Memorial Museum. Davis Brody Bond Partners Steven M. Davis, FAIA, and Carl F. Krebs, AIA, have been involved with the project since its inception in 2004. 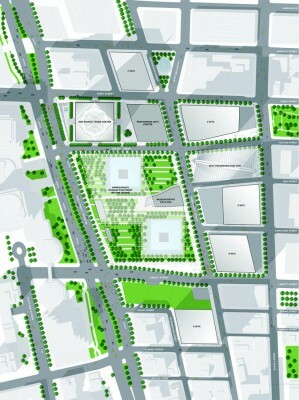 Steven M. Davis also developed the Public Space Master Plan for the World Trade Center in 1992 and Carl F. Krebs was the Partner-in-Charge for Davis Brody Bond’s participation in the development of the 9/11 Memorial. 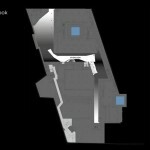 The 9/11 Memorial, at the plaza level, was designed by Michael Arad and Peter Walker and Partners. Davis Brody Bond served as associate architect of the Memorial.